There is a Fourth Edition in press, due ca July 2002. Springer's information has shown some confusion: at one time this volume was known as `Volume 1: Data Analysis' and the companion as Volume 2, but this was changed a long time ago. The Second Edition (ISBN 0-387-98214-0) was published in July 1997 and had three printings. The First Edition (ISBN 0-387-94350-1) was published in 1994, had four printings and sold over 10,000 copies. There are mirrors of this material at Oxford, Sydney, StatLib (Pittsburgh) and Wisconsin. S-PLUS® is a powerful environment for the statistical and graphical analysis of data. It provides the tools to implement many statistical ideas that have been made possible by the widespread availability of workstations having good graphics and computational capabilities. This book is a guide to using S-PLUS to perform statistical analyses and provides both an introduction to the use of S-PLUS and a course in modern statistical methods. S-PLUS is available commercially for both Windows® and UNIX® workstations, and both versions are covered in depth. 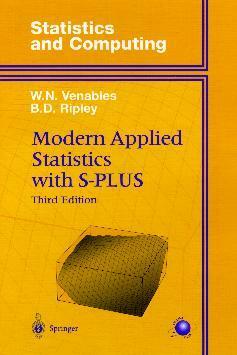 The aim of this book is to show how to use S-PLUS as a powerful and graphical data analysis system. Readers are assumed to have a basic grounding in statistics, and so the book is intended for would-be users of S-PLUS and both students and researchers using statistics. Throughout, the emphasis is on presenting practical problems and full analyses of real data sets. Many of the methods discussed are state of the art approaches to topics such as linear, nonlinear and smooth regression models, tree-based methods, multivariate analysis and pattern recognition, survival analysis, time series and spatial statistics. Throughout modern techniques such as robust methods, non-parametric smoothing and bootstrapping are used where appropriate. This third edition is intended for users of S-PLUS 2000, 5.x, or 6.x, although S-PLUS 3.3/4 are also considered. The major change from the second edition is coverage of the current versions of S-PLUS. The material has been extensively rewritten using new examples and the latest computationally-intensive methods. The companion volume on S programming will provide an in-depth guide for those writing software in the S language. The authors have written several software libraries which enhance S-PLUS; these and all the data sets used are available on the Internet in versions for Windows and Unix. They are also supplied with S-PLUS 2000 Professional edition. There are extensive on-line complements covering advanced material, user-contributed extensions, further exercises and new features of S-PLUS as they are introduced. Dr. Venables is now Statistician with CSIRO in Queensland, having been at the Department of Statistics, University of Adelaide for many years previously. He has given many short courses on S-PLUS in Australia, Europe and the USA. Professor Ripley holds the Chair of Applied Statistics at the University of Oxford, and is the author of four other books on spatial statistics, simulation, pattern recognition and neural networks. S-PLUS is a commercial system of the Insightful Corporation. The book is also useful with R, a freely-available open-source statistical system `not unlike S'. We have tried where possible to use code that works in all versions of S-PLUS and in R.
Some additional exercises on both S programming and data analysis are available for downloading. There are answers to almost all the programming exercises and some of the data analysis problems. The PDF version has extensive hyperlinks, for example between exercises and their answers. Viewers can be downloaded from www.adobe.com; a suitable viewer is normally installed with S-PLUS4.x, 2000 and 6.0 on Windows. Only those for the current edition are maintained. The Second Edition was written when S-PLUS 3.4 was current; version 4.0 appeared shortly after the book. The Third Edition has been extensively revised, assuming that the reader has S-PLUS 4.0 or later, and it takes account of S-PLUS 5.x and 2000. As much of the material as possible is usable with S-PLUS 3.3/4 and also with R.
The statistical material has been re-organized, with robust and bootstapping methods being moved into the main exposition. There are accounts of the analyses made possible by the nlme3 and survival5 software. We have added enhanced software for robust regression and for proportional odds logistic regression, and provided in-depth analyses using these. There are new examples and extensive exercises. The material on programming has been reduced: a much more comprehensive account is given in the companion volume S Programming. Links are provided to Springer's home pages in Germany and the USA.